I feel like I’m always jumping from one method of “fixing” my life to another. Minimalism. Gratitude. Meditation. Elimination diets. Cleanses. Supplements. More sleep. More exercise. More water. The list goes on and on and on. Everyone has a method to improve your life and I think I’ve tried at least half of them. Why is the human conditioned to searching for a cure to our humanness? Deep down, reality sets in. Our very human nature, since the beginning of time, is one of brokenness. For some of us, this manifests as an overwhelming urge to control all the things. For some their best is never enough. Some suffer through crippling anxiety and depression. Some fall over and over again to their own addictions. In the world of motherhood, we’re consumed by “mommy wars”, by the crushing fear of being judged and the crippling need to compare ourselves to others – the need for external validation as a means of finding satisfaction with of our identity as a mother and wife. We’ve placed our worth in our motherhood, our marriage, our appearance, our career, our money, notoriety, worldy goods. We’ve forgotten our worth comes from Christ. How often do you hear stories of people finding Christ through the depths of despair? That it took hitting rock bottom or failing at everything else before we are able to get out of God’s way and let him in – let him touch our brokenness and remind us of its beauty and worth? I was on a play date once when Baby A was really little and V was 3-ish. The little boy we met with was a typical boy, rowdy and energetic and often a bit out of control. I can’t remember if he hit or pushed or tripped V or if he was just overly excited and she didn’t like it, but she ended up crying and the boy’s mother looked as if she was on the verge of crying herself. She looked defeated and exhausted and ashamed. She tried to hide her frustration and embarrassment. She tried to hide her brokenness. I told her a story of how V once threw a doll that hit another little girl right in the face. I told her how she once broke her front tooth on a grocery cart. I told her how I bonked her head on the bathtub faucet when she was still a tiny baby. Vulnerability breeds honesty. And honesty breeds friendship. And friendship breeds community. And it is through community we learn our brokenness is part of our beauty. And that maybe we aren’t quite as broken as we think. 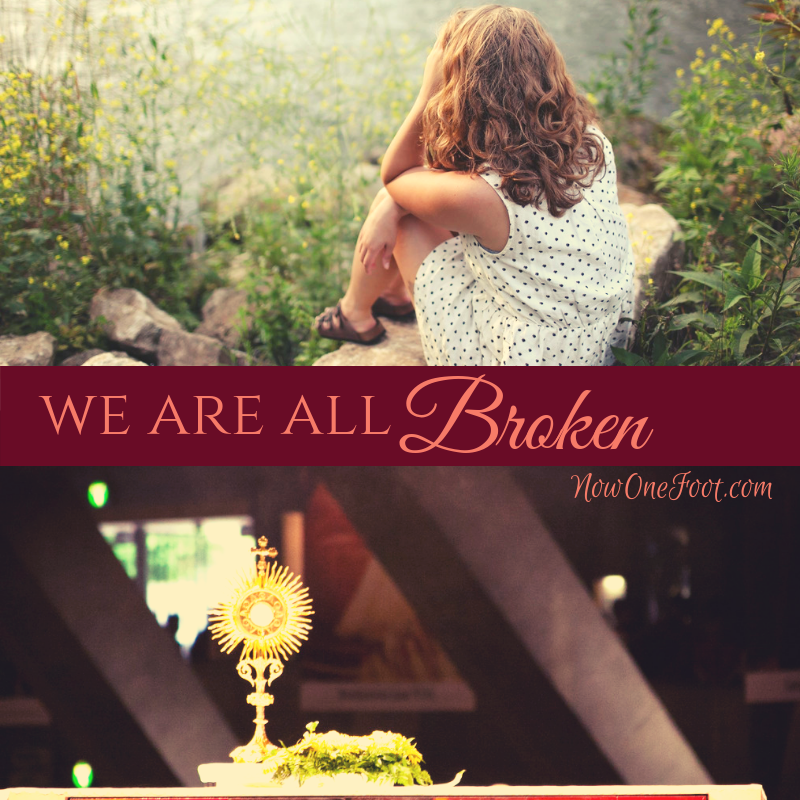 Jesus gave us His brokenness made perfect in the Eucharist. Let’s try to embrace our own brokenness and draw near to him through the sacraments and through the honesty of community.